Our games editor pops his real-time strategy cherry with Carrier Command: Gaea Mission, a remake of an Amiga classic. 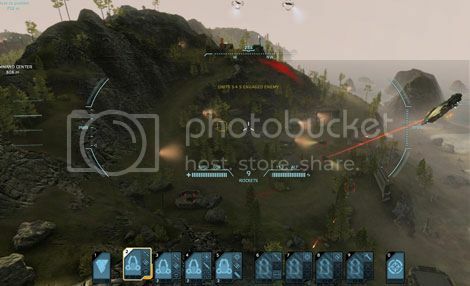 Carrier Command: Gaea Mission is my first foray into real time strategy. I don't know how I've overlooked this particular type of game for so long, God knows I haven't made a conscious effort to avoid them, I just don't think they've ever really grabbed me when I've seen them on the shelf. Needless to say, I have not played the original Carrier Command for the Amiga, so I'm coming into this game pretty much blind - which can sometimes be a good or bad thing, depending on the game. Earth has been split into two factions: the United Earth Coalition (the good guys), and the evil, land grabbing Asian Pacific Alliance. The battle on the home planet is long over, with the APA gaining full control, but unfortunately leaving Earth a bit on the post apocalyptic side. Luckily, there's hope in the depths of space - a planetoid called Taurus holds enough fresh water in its oceans to completely sort out the old homestead. Which is handy. Unfortunately, the APA (being the more powerful and efficient of the two factions) has already set up camp on Taurus, and is happily plodding away, dominating all the coolest strategic positions, and generally being evil with their gigantic, heavily armed, battle carriers. However, the UAE have decided enough is enough and set into motion a plan to land on Taurus, take control of a decommissioned enemy carrier, repair it, and start taking the power back one island at a time. First impressions usually count for a lot when I'm taking on a new game, but I'm relieved to say that my original misgivings in my first hour of gameplay soon melted away. That's not to say that there aren't some controller crushingly annoying quirks about the game, but you'll find yourself forgiving these, as you get engrossed in the campaign. If, like me, you're inexperienced in the world of RTS, then I highly recommend playing the Campaign first. It gradually breaks you in to the, at times, infuriating control scheme, allows you to get to grips with the strategy aspect of the game, and shows you the importance of being cautious. If you just run into a situation, guns blazing, you will be destroyed. All the action is controlled from the carrier. You remotely control up to 4 land vehicles (Walrus) and 4 air support vehicles (Manta), as well as an on board arsenal of deck guns. At the start of the campaign, your vehicles have basic weapons, and practically no armour, so you need stay on your toes. Reconnaissance is a must, as going into a situation blind will more often than not see you mourning the loss of yet another vehicle. 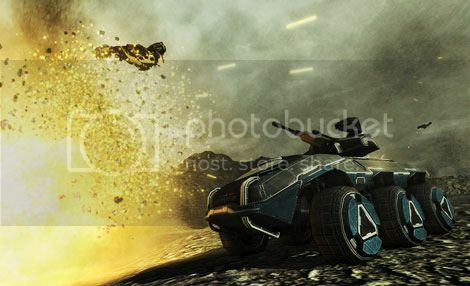 To start with, this can result in an instant game over, as the ability to create new vehicles, weapons and gadgets only becomes unlocked as you progress within the campaign. As you overrun, and take over more islands, more resources become unlocked, and you gain access to enemy intel - which means more weapons, more vehicles, better armour, and the ability to create all of them. Now, to the negative. 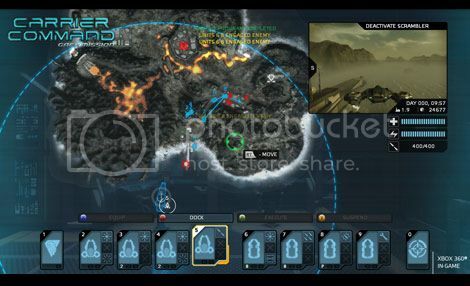 You can control all of your vehicles individually, via cockpit or third camera view, or you can automate them by plotting points on the map and choosing targets, or playing a digital follow the leader (you take control of one vehicle, the rest follow). Now, this would be amazing if the AI was up to scratch - unfortunately, it's not. It's most evident when attempting to automate your Walrus (so to speak). After a couple of minutes watching your land assault team driving around in circles desperately trying to cross a waypoint, you will just give up and take back control. Mantas are a bit more forgiving, but you need to keep a close eye on them. If the action gets too hot, you can quickly send them back to the Carrier at the push of a button - this isn't such a good idea with the Walrus, as god knows there are enough nooks and crannies for them to get lost in, and the AI won't always choose the path of least resistance. You're going to be doing a LOT of micro managing. Also, when you do take control of your vehicles, they handle worse than those abominations used to explore planets in the Mass Effect Universe. You eventually get used to it, but I do think that by trying to appeal to a more action orientated audience, they might have shot themselves in the foot. No more is this evident than in the un-needed FPS elements that have been shoe horned into some of the campaign mode. By scrimping on the AI and hands on vehicle controls, instead of polishing one or the other, the developers have missed out on making an almost perfect gaming experience. The positive, however, is that the game is so finger knawingly addictive, you'll soon forgive its flaws. It's not an easy game to get to grips with, and the difficulty curve is unforgiving - but that only drives you forward, determined to take one more island, try one last assault, until finally, it all falls into place. You attack from the right vantage point, your vehicles work in unison, and you overrun the enemy command centre. Once you've completed the campaign, you're now fully prepared to take on the game's strategy mode. You can pretty much tailor a game to play to your strengths, so it can be as challenging or easy as you need it to be. You can start off the strategy with almost full control of Taurus' islands, and an enemy weaker than an anaemic kitten, or as a true underdog that needs to slowly build up it's resources, island by island, against an almost unstoppable force. There are few games I know I'll still be playing a year down the line, but this is definitely one of them. It might be a little unpolished, the campaign plot might be tissue thin, but once it sinks its teeth into you, you're hooked.